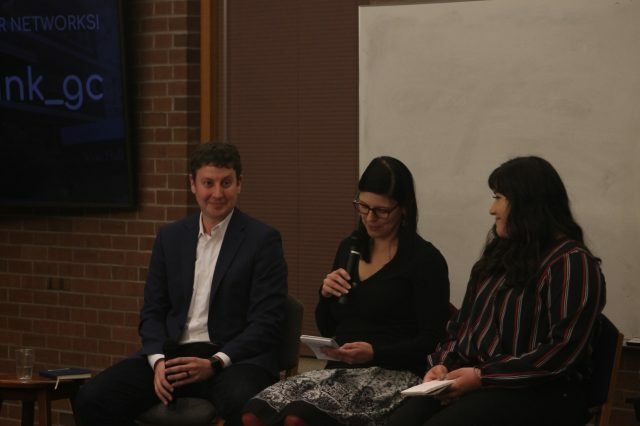 On Tuesday, Jan. 15, Career Networks and Goshen College’s communication department hosted The Great Media and Marketing Meet-Up, an event that allowed students and faculty to listen to guest speakers share their career experiences. The evening began with a meal prepared by AVI Fresh. It proceeded with Career Networks coordinator David Kendall introducing Marshall King, adjunct professor of communication and host for the evening’s program. Marshall King introduced the three guest speakers for the night, all of which were GC alumni: Nick Johnson, Celeste Kennel-Shank and Karina Flores. The program consisted of a question-and-answer session from King and was opened up to the audience at the end of the evening. Nick Johnson, director of strategy and training at the Idea Center of Notre Dame University, was touched to be back speaking at the Goshen College campus. He remembered witnessing his aunt’s wedding in the campus Church-Chapel when he was only three years old, as well as working at the Physical Plant when he was a student himself. Johnson reflected on his journey through different jobs he has held since graduating from Goshen College. He shared with the audience the power of storytelling and how stories can be told through all kinds of mediums. On top of his position at Notre Dame, Johnson is also a coach and teacher. He continued to drive home this point to the audience: “Try a lot of stuff. Screw it up. Learn from it. Keep going.” He emphasized that Goshen College was a great place to make mistakes, learn from them and to gain invaluable experience. Celeste Kennel-Shank, news editor for The Christian Century, also shared similar knowledge and advice as Johnson. She stressed to students that it is important for them to try a variety of different things while in school and to take advantage of the opportunities that Goshen College offers. She also talked to the audience about the hardships of working as an editor. Sometimes people have to make tough decisions from an ethical standpoint. She has struggled in the past with publications in obituaries and the responses from families. Kennel-Shank encouraged her audience to understand that they can’t make everyone happy and to be confident in their writing and who they are. The most recent graduate, Karina Flores, works as a multimedia journalist for WNDU, a local CBS network. She graduated two years ago and genuinely felt that the experiences she had at Goshen College prepared her for career today. She also encouraged students to be involved. “Being a part of The Correspondent, The Globe and the communication department helped me so much,” said Flores. Flores shared a personal story exemplifying the power of her job as a journalist. She wanted to help a neighbor, whose daughter has epilepsy, afford a service dog so that her daughter would have more help at school when she was about to have a seizure. Flores did a feature of the family on the news, and many viewers wanted to help and made donations. That is her favorite part of her job: the people she gets to impact. David Kendall, coordinator of Career Networks, helped put the event together and was very pleased with the turnout. “It was powerful to hear the three panelists talk about their career journeys. I especially enjoyed hearing them each talk about how the human component of their jobs is most important,” Kendall said. “Skills and talent are necessary, but it’s the connections to people that make careers even more rewarding. It seems like Goshen College grads get that on a different level,” said Kendall.